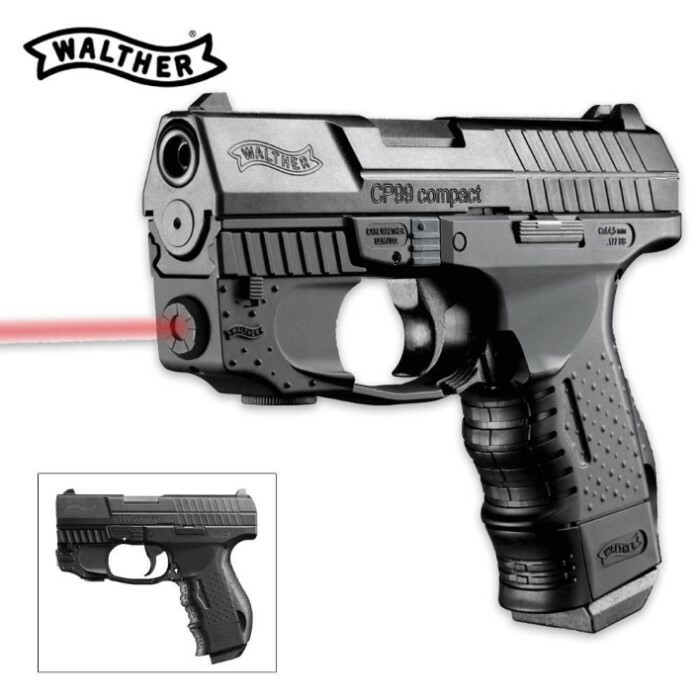 Walther C99 Compact Pistol w/Laser | BUDK.com - Knives & Swords At The Lowest Prices! Includes detachable red laser, Blowback (slide kick) action, Semi-auto, and Shoots BBs. 18-shot removable (drop out) magazine, Replica magazine release lever and Powered by CO2. Ergonomic grip with finger grooves, Compact size and Authentic Walther Replica. Caliber0.177, Action: Semi-Auto (repeater) and PowerCO2. Barrel Length: 3.6, Safety Type: Manual, Rear Sight Type: Notch - Fixed, and Front Sight Type: Blade - Fixed. Barrel Type: Smooth and Ammo Type: BB. Firepower Pro Series Powerjet 12g CO2 Cartridges 20-Ct.